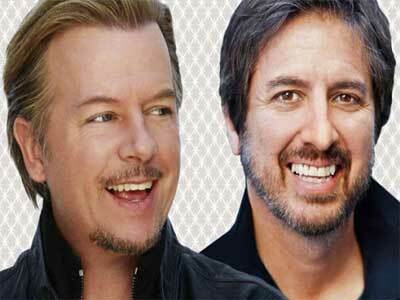 The Mirage Hotel and Casino present a night of comedy with Ray Romano and David Spade. Don't miss out on your chance to see these two hilarious stand up comedians/tv mavens/movie stars LIVE! Online booking is now available! Appearing at the Mirage at part of the Aces of Comedy series, Ray Romano and David Spade will entertain you with an evening of banter. Ray Romano from the sit-com Everybody Loves Raymond teams up with David Spade the wisecracking assistant from Just Shoot Me to provide you with an evening you won’t soon forget. Seriously funny, this duo, with opposites in comedy style, will provide a night of laughs. This is a limited engagement so get your tickets quickly. These two comedy giants feed off of each other’s wits and tell funny stories and jokes about things everyone can relate to. Part of the Aces of Comedy series, this duo performs together rarely so their show is much anticipated and well-received. Regular visitors to Vegas, Romano and Spade also enjoy roasting the town and it’s reputation.